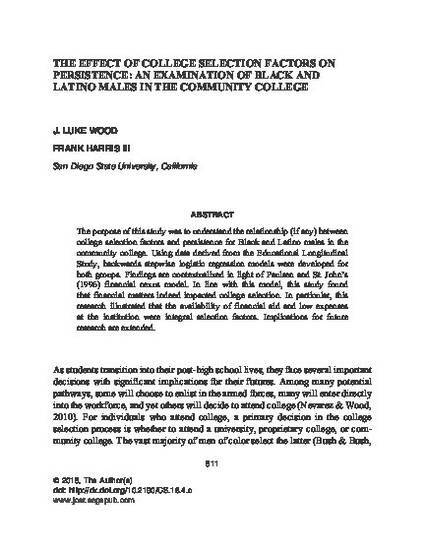 The purpose of this study was to understand the relationship (if any) between college selection factors and persistence for Black and Latino males in the community college. Using data derived from the Educational Longitudinal Study, backwards stepwise logistic regression models were developed for both groups. Findings are contextualized in light of Paulsen and St. John’s (1996) financial nexus model. In line with this model, this study found that financial matters indeed impacted college selection. In particular, this research illustrated that the availability of financial aid and low expenses at the institution were integral selection factors. Implications for future research are extended.